As I write this I am recovering from quite a decent bout of food poisoning. I have pinned it on an absolutely delicious Vietnamese meal I ate 6 days ago, in a nice, clean restaurant. It’s a shame as Vietnamese is the flavour du jour! However, I am determined not to let it put me off this amazing fresh cuisine. 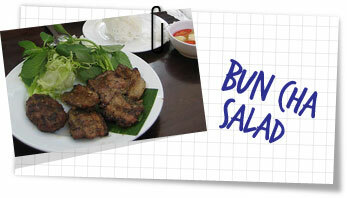 So here’s a recipe for one of my favourite Vietnemse dishes. Tiny, juicy morsels of pork served simply with noodles and salad. It’s pretty damn tasty not to mention actually quite healthy. Just be careful not to poison yourself. In a pestle & mortar grind together the garlic, chillies and sugar to form a thick paste. Add the lime juice, fish sauce and 5 tablespoons of water. Stir well and leave for 1/2 hour to let the flavour develop. Combine with your hands all the ingredients until you reach a smooth paste. Mould the paste into small balls (about the size of a walnut) then flatten to make a small pattie. Place under a hot grill and cook, turning until browned on all sides (about 8-10 minutes), or better still cook on the barbecue until browned. Divide the noodles into 4 deep soup bowl, then top each with a large handful of lettuce then a small handful of carrot and cucumber. Add a couple of slices of tomato then divide the bun cha evenly between the bowls. Finally, sprinkle over 1 tablespoon each of crispy onion and peanuts and garnish with fresh mint leaves. Pour equal amounts of the dressing over the salads just before serving.